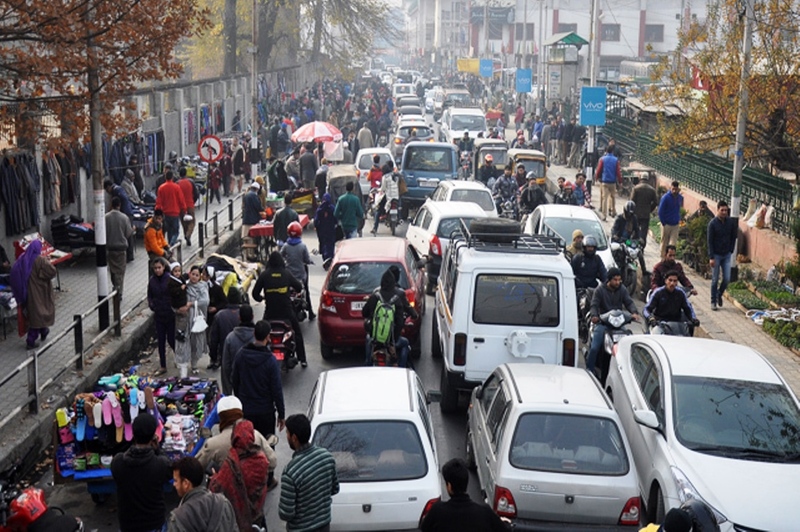 Srinagar: In certain areas of Srinagar city, shopkeepers and vendors have encroached the footpaths which create problems for pedestrians and they are forced to walk on the main road. It seems footpaths are not meant for people as these are used for special commercial purposes after being encroached upon by shopkeepers, fruit and vegetable vendors. The shopkeepers in different areas of Srinagar especially in Baghwanpora area of Noorbagh and Safakadal have set up stalls on footpaths and roads thereby hindering the movement of pedestrians. “These consciousness shopkeepers and vendors choke the movement of traffic, causing inconvenience to common people. SMC is blamed for all this mess. I myself witnessed many times a police party removed some vendors near Safakadal, but as soon as the party disappeared, the vendors re-occupied the footpath,” a local, Mukhtar Ahmed told Kashmir Life. According to the residents, shopkeepers ruins the market appearances and makes the life of the pedestrians miserable and hell. “Shopkeepers now illegally consume footpaths for selling their products also plays with the life of students and elders, because we now have to walk on roads instead of footpaths,”Iqra, Media student, said. The residents alleged that the maximum number of shopkeepers illegally expanded the space of their shops to display more varieties of goods for customers. From past couple of days, IG Traffic has removed encroachments at different places in Srinagar city without succumbing to any pressure. “It is good to see, he is targeting the big fish. It is the job of SMC to clear encroachments but unfortunately, they are not acting against encroachers,” said Mudasir Ahmed, a student of Kashmir University. Some people said that the hard work of Traffic cops led by Basant Rath goes waste once he leaves an area. SMC ward officer of Safakadal Eidgah Mohammad Maqbool Bhat said we will take strict action against them. Already the particular shopkeepers are in our notice and if they are continuing with the same process, we will take strict action against them further he added, if those culprits will still continue with it, then we will charge some fine from them as well.